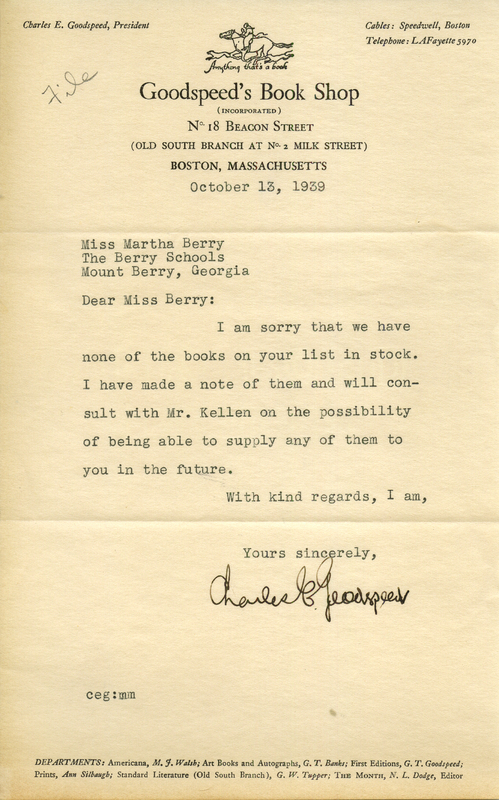 Letter informing Martha Berry that the books she wished to order are no longer in stock. He lets her know that he made a note of them and will consult Mr. Kellen with the chance of being able to supply her with them in the future. Charles E. Goodspeed, “Letter from Charles E. Goodspeed to Martha Berry.” Martha Berry Digital Archive. Eds. Schlitz, Stephanie A., Camille Hanner, Jessica Hornbuckle, et al. Mount Berry: Berry College, 2016. accessed April 26, 2019, https://mbda.berry.edu/items/show/14983.